John Henry is a journalist and author based in New York City who has reported on business for the Associated Press, Newsday and The (New York) Daily News. He now freelances and his articles on travel and transportation have appeared in major newspapers in the United States and Canada. He also has been published in the quarterly journals of the Steamship Historical Society of America and Great Lakes Historical Society. He is the author of Great White Fleet: Celebrating Canada Steamship Lines Passenger Ships, the first book devoted exclusively to the vast fleet of passenger steamers once operated on the Great Lakes and St. Lawrence River by Canada Steamship Lines of Montreal. This handsome and abundantly illustrated hardcover book traces the rich history of these steamers from the creation of CSL in 1913, when it inherited more than 50 passenger vessels from its predecessor companies, until the last ships were retired in 1965. For those who once sailed with the Great White Fleet and for those who wish they had, this book offers a window into a wonderful lost way of life. John Henry, a native of Buffalo, N.Y., is an alumnus of Trinity College, Hartford, Conn., and holds master’s degrees from Columbia University’s business and journalism schools. He lives in Manhattan with his wife, Sally, memorabilia from Canada Steamship Lines always close at hand. In Toronto, Nautical Mind bookstore. In Kingston, Ont., Marine Museum of the Great Lakes and Novel Idea bookstores. In Buffalo, N.Y., The Lower Lakes Marine Historical Society Museum. In St. Catherines, Ont., Welland Canals Centre, Lock 3. Also available at amazon.com or amazon.ca. "Corona, Cayuga, Chicora, Chippewa, Tadoussac, Richelieu ... wonderful names that evoke wonderful memories of a time when boarding Canada Steamship Lines’ Great White Fleet of Great Lakes passenger ships destined for such charming destinations as Niagara-on-the-Lake, Montreal, and Quebec City was as exciting as sailing across the Atlantic." Mike Filey, Toronto Sunday Sun columnist and author of Dundurn’s Toronto Sketches series. 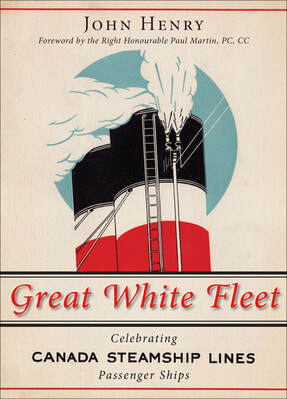 "Great White Fleet perfectly captures the joy of travel on these beautiful steamships, vividly recalling a more elegant era. This is going to be a valuable addition to the written lore of the Great Lakes and St. Lawrence Seaway.” — Roger LeLievre, publisher of Know Your Ships. "John Henry has done a wonderful job in researching and writing about the beautiful passenger ships of Canada Steamship Lines. His work is thorough and a very appropriate reminder of the legacy of this great Canadian shipping company as they celebrate 100 years of service on the Great Lakes in 2013." — Skip Gillham, author of The Postwar Ships of Canada Steamship Lines and co-author of The Early Ships of Canada Steamship Lines. "Thirty of Canada Steamship Lines' prominent passenger steamers are included in this truly visual feast of excellent-quality, glossy, classic black-and-white photographs and colorful advertising brochures, conveying the ambiance and experience of traveling these routes by steamboat." — PowerShips, quarterly journal of the Steamship Historical Society of America.The society cited Great White Fleet in honoring John in May 2014 with its C. Bradford Mitchell Award "in recognition of his dedicated service to the field of maritime heritage." "The measure of a good book is often the degree to which it informs and entertains. Great White Fleet — well written and magnificently illustrated — does both exceedingly well for this fascinating subject." — Maritime Engineering Journal, Canada Department of National Defence. Featured as Book of the Month in the April 2014 issue of the British publication Ships Monthly, which describes itself as "the world's leading international shipping magazine."